With advanced economies remaining sluggish, Asia will continue to power the global economy. Paris may be the “city of light,” but there was little economic sunshine on Tuesday as the Organization for Economic Cooperation and Development (OECD)’s headquarters delivered a report slashing its 2013 growth forecasts for its members. With the International Monetary Fund having also downgraded the outlook at its recent Tokyo conference, can Asia overcome the gloom stemming from Europe? 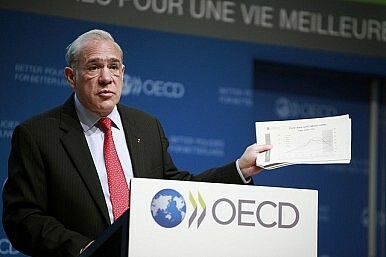 “The world economy is far from being out of the woods,” OECD Secretary-General Angel Gurría said during the launch of its latest Economic Outlook in the French capital. “The U.S. ‘fiscal cliff’ if it materializes, could tip an already weak economy into recession, while failure to solve the euro crisis could lead to a major financial shock and global downturn,” he warned. The OECD’s 34 developed member economies are expected to grow by a sluggish 1.4 percent in 2013, down from its 2.2 percent rate forecast in May. The global economy is predicted to grow by 3.4 percent in 2013 and 4.2 percent the following year. The twice-yearly report mirrored that of the International Monetary Fund, which in October forecast advanced economies would grow by just 1.3 percent this year and the world economy by 3.3 percent and 3.6 percent in 2012 and 2013 respectively. Growth forecasts for this year and the next for the United States and Japan were again lowered by the OECD, with the eurozone’s recession thought to be even deeper than previously expected. Warning that the eurozone’s debt crisis “remains the greatest threat to the world economy,” the OECD said the 17-nation bloc would remain in recession until early 2013, with GDP declining by 0.1 percent next year before rebounding in 2014. Greece is set to remain a drag on the region with the OECD expecting its GDP to contract by 4.5 percent next year, the most of any European economy. In addition, the OECD’s army of 50 million jobless may see its ranks swell in Europe, with the eurozone’s unemployment rate forecast to remain above 11 percent for the next two years. Provided that American lawmakers reach a compromise to avert automatic tax hikes and spending cuts, the OECD expects the world’s largest economy to grow by 2 percent in 2013, and 2.8 percent the following year. This is up compared with May’s estimates of 2.4 and 2.6 percent growth, respectively. The tepid recovery in advanced nations was blamed on private sector deleveraging, fiscal consolidation measures and insufficient action by policymakers, along with domestic issues in emerging economies. As Japan heads to the polls, its beleaguered government can take little solace from the OECD’s report, which forecasted that the world’s third-largest economy would grow just 0.7 percent in 2013, around half of what it expected in May. The Diplomat earlier reported that Japanese Prime Minister Yoshihiko Noda is expected to pay the ultimate political price for his recent fiscal reforms in the coming December 16 general election, although economists expect the Japanese economy to emerge from recession next year. However, neighbor South Korea is expected to see its growth rate climb to 3.1 percent in 2013 and 4.4 percent the following year, bolster by stronger export numbers. According to the OECD, Seoul has scope for fiscal and monetary stimulus due to its “sound public finances and low inflation,” although it urged more structural reforms to boost labor force participation and productivity. Growth rates in the BRIC nations are expected to remain solid thanks to more supportive monetary and fiscal policies. Despite the fact that Beijing is expected to post its lowest growth rate in a decade this year, the OECD sees the world’s No. 2 economy increasing GDP by 8.5 percent in 2013 and 8.9 percent a year later. On Tuesday, however, the benchmark Shanghai Composite index ended at 1991, the first time it had closed below 2000 since January 2009, with analysts growing pessimistic on the likelihood the new leadership will introduce a large stimulus package. “As growth picks up, the pace of [China’s] public spending should be reined in but its re-orientation towards social services should continue. If economic prospects were to unexpectedly worsen, however, there would be room for monetary and fiscal stimulus,” the OECD report stated. India is also predicted to recover from this year’s decidedly downbeat 4.4 percent growth, posting rises of 6.5 percent in 2013 and 7.1 percent a year later. “Growth is expected to remain weak for some time,” the OECD said, saying more fiscal restraint was needed to avoid a further deterioration of confidence in Asia’s third-biggest economy. Meanwhile, Australia is expected to perform “slightly below potential” over the next two years due to the global slowdown, with GDP expected to rise by 3 percent in 2013 and 3.2 percent a year later, down from previous estimates but continuing its record 21 straight years of expansion. "Despite the decrease in [Australia’s] terms of trade, the mining sector can still be expected to sustain growth which remains marked by substantial sectoral disparities," the OECD said. "Nevertheless, the high exchange rate, continued household deleveraging and budget-tightening in 2012/13 should damp activity in many other sectors." ANZ economist Justin Fabo agreed, saying that Australia’s real GDP growth would “moderate to around 2.75 percent in each of 2013 and 2014, which is below trend”. “The key, however, is that with commodity prices no longer rising every year, Australia's real income growth will be much slower than over the 2003-11 period,” he told The Diplomat. With Western policymakers showing little appetite for rapid reform, it appears Asia minus Japan will once again come riding to the rescue of the more “mature” economies.